BEIJING- China’s second woman astronaut Wang Yaping, who is currently orbiting the Earth in an experimental spacelab, has become the country’s first space teacher as she delivered a lecture to over 60 million Chinese students about various aspects life in space. In a 45 minutes lecture, Wang, an airforce pilot assisted by her two male colleagues demonstrated weightlessness and how it affects the Newton laws of gravity. In a live telecast lecture to about 330 primary and middle school and watched by more than 60 million students and teachers at about 80,000 middle schools besides hundreds of millions of awestruck Chinese. Virtually floating, Wang showed a small ball tied with a string to a holder fixed on a metal plate to show how it did not move like a pendulum on the earth and instead moved in a circular motion. She later made a water film stuck in metal ring to explain the features of surface tension. Water magnifies in space due to zero gravity, she said. “Hello, everyone. I am Wang Yaping. I will host the lecture today,” she said, smiling towards the camera, on board of the space module Tiangong-1, the experimental lab being built by China to rival Mir, the international space station currently managed by Russia and US. China’s space station was expected to be ready by 2020. Wang and her crew members set off to the space aboard the Shenzhou-10 spacecraft on June 11 and the spacecraft docked with the Tiangong-1 on June 13. Wang showed students how normal scales, working under the influence of gravity, did not work inside the orbiter. Then, she introduced the special scale on board of the orbiter, which was designed on basis of the Newton’s second law of motion, or measuring the mass of an object through the net force and the acceleration. 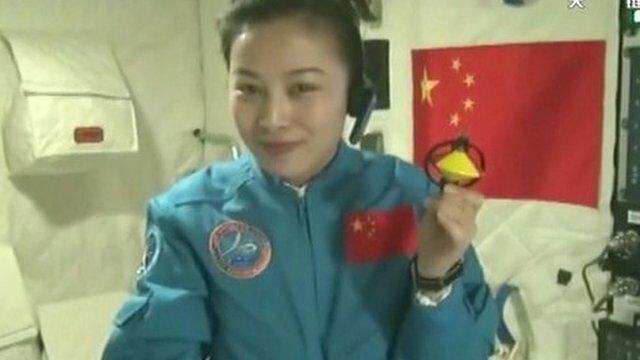 The 33-year-old Wang is the second Chinese woman astronaut after Liu Yang. The world’s first teacher in space was Christa McAuliffe, a 37-year-old middle school teacher from the United States, but the Space Shuttle Challenger she was aboard disintegrated after 73 seconds in flight on January 28, 1986. McAuliffe and her other six crewmates were killed. Barbara Morgan, McAuliffe’s backup in that mission who became an astronaut later, completed the teaching lesson in space in 2007, when she was sent to the International Space Station with Space Shuttle Endeavor.